Amour, the final piece of the puzzle that I had to watch before offering my Best and Worst lists, comes from world-renowned, tremendously frustrating filmmaker Michael Haneke. In the past, Haneke has befuddled with movies like Caché, Funny Games, and The White Ribbon, and has made a name on playing on audience expectations. There is something to be said for this technique that makes for an interesting discussion. It also makes for movies that are alienating and cold. That’s the point, and Haneke always seems to succeed. If the true measure of a movie’s greatness is to aim for one thing (greatness? be the stupidest comedy of all time? make people horny? frustrate them to madness? ), then under that rule, Haneke is a master filmmaker. However, call me alienated. Haneke’s films are a paradox because while they succeed at doing what he wants them to do, they are puzzles you may not ever figure out and leave you unfulfilled. This is a valid worldview, since there are many mysteries we will never solve, yet people will endlessly try to figure them out without the proper clues. Haneke seems to say with every film, “This is something that happened. Why did the characters do what they did? Who can ever know?” Some stories are all the more intriguing without an explanation. Sometimes an explanation ruins the story. Wait, do I like Haneke all the sudden? You see? Frustrating. Amour, one of the ten nominees for 2012’s Best Picture Oscar race, and pretty much shoo-in for Best Foreign Picture, at once takes on qualities of frustration, but in the end, this movie is very well made and deserving of its praise. Maybe it’s because for the first time in a Haneke movie, I could relate to the characters. It’s a first, I feel. In the other movies, character empathy is nearly impossible. 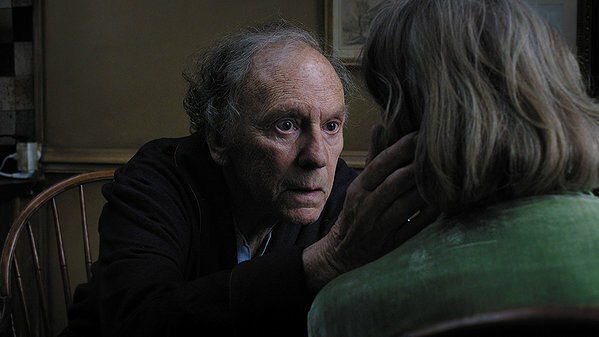 Former music teachers Georges (Jean-Louis Trintignant) and Anne (Emmanuelle Riva, who is nominated for Best Actress) are an older couple going about their retirement years, humming along til death do they part. Then, out of nowhere, Anne develops an affliction. She needs surgery on a blocked carotid artery, but the surgery goes wrong, and she’s left paralyzed on her right side. This begins the awful journey that Georges and Anne must endure together: Georges taking care of Anne, Anne getting worse and worse. Georges watches his wife change right before his eyes, becoming a little meaner, a little unsure of what she wants, becoming less coherent. The whole title, “Amour,” is basically referring what two people will do for each other even in the most difficult of times: their interactions can be heartwarming and heartbreaking all at once. We hear snippets of the past, small insights into their characters, but never so much that we “know” who they are. There’s a point where Anne says, “You are a monster sometimes. But very kind.” We see some moments where this is true. During all of this, there are visits from people who mean a lot to them: their daughter Eva (Isabelle Huppert), Anne’s former student-turned-pro Alexandre (Alexandre Tharaud). At some point, Georges needs to hire a nurse to come by and help out. Eva wants her mother hospitalized, Georges is stubborn…actually Anne is stubborn. She makes him promise to never take her to a doctor again. Understandable after they screw up an operation with a 5% failure rate. Haneke has all the hallmarks of his style in place here: long takes where you wonder if there is anything important to observe in the scene (an early scene has an audience watching a piano player, but we never see the person playing), and then times where the scene cuts seemingly all too early (usually involving music). There are two or three horrific scenes in the movie, probably something that many horror movies of today could learn from, where the horror comes out of nowhere. Haneke can lull you into a false sense of security because he’ll take you through scenes where nothing out of the ordinary happens, and your brain is trained not to expect anything, which makes it all the more effective. In the end, I really liked this movie. The ending is going to leave a lot of people wondering and discussing, but this time, Haneke doesn’t throw you off a cliff with one piece of a hang-glider, a piece of tape, and a box of paperclips. Amour will wrap you up in its story, will engage with expert filmmaking, and likely will have you talking to yourself later. But it’s way more successful than his other ventures into the audience-provoking genre. Obviously, it would be nothing without two command performances from Trintignant and Riva. As a side note: The movie shares a lot in common with Sarah Polley’s 2007 film Away from Her, although that movie is more accessible and the plotting is different. Polley’s film got her a writing nomination and Julie Christie her 4th Leading Actress nomination. They would make an interesting double feature one day.